Wanna grow your following, better appeal to your target audience, and just plain get found? Hashtags may be for you. But so much confusion still abounds about how to use them. Below are the basics. Before we get started, one caveat: the need for integration cannot be overstated. Organic reach is at an all-time low on social media, so social — with or without hashtags — should by no means be a standalone strategy. Social engagement needs to be leveraged to a) build an audience that you own (i.e. email list), and b) drive traffic to your website or other landing page through a solid call to action. With that, let’s plough on. Conceived 10 years ago (August 23, 2007) by Chris Messina, a Twitter user who wanted to establish a better way to group things on Twitter, the #hashtag has evolved into a super-effective means of finding people and/or content. Businesses are using them to grow their audiences by including relevant tags in their social posts. They’re being used for both personal and professional means. Personal social profiles have fun with creating their own fun #hashtags that allow them to connect with others who have similar interests. That very strategy though is what business users are also leveraging to build their tribes. The only difference might be the amount of research that goes into #hashtag selection. WHY is the #hashtag effective? In the simplest terms, #hashtags allow users to find and get found faster. Enter one in social search to wade through the ever-growing noise in a social media feed the way search engines crawl the internet, delivering focused, relevant results fast. And add them to your social posts so that others can find you just as quickly. The #hashtag was pioneered on Twitter, but its overwhelming success prompted other platforms to give it a try as well. To date, only two platforms seem to have effectively leveraged widespread use: Twitter and Instagram. Facebook and LinkedIn have tried, but the #hashtag doesn’t really make sense in the context of either platform. Probably the most popular tag among Facebook users is the annoyingly passive-aggressive #justsayin/#justsaying and the equally cringey #sorrynotsorry. Usage differs from Twitter to Instagram, mainly due to Twitter’s 140-character limit and the difference in audiences. In Twitter, stick to two to three #hashtags, max. Readers have a low tolerance for posts that contain more #s than letters. On Instagram (right now), the sky’s the limit. But I still recommend not clogging up your original posts with #hashtags. Like the example below, keep your original message clean. Once published, revisit the post immediately and add a comment that contains only #hashtags. Native search — within Twitter / Instagram, search for the most popular terms used by three different segments: your audience, your competitors, and the leaders in your industry. Hashtagify.me — this free tool makes it easy to search for #hashtags, see who’s using them, how frequently and recently they’ve been used, and to find strong, related terms as well. A wee note here… if you’re going to devote time and effort to finding #hashtags, you might want to maximize your return on investment by compiling a list of them in a notes app on your mobile device. This will save you time in the future. Once you start to see them in action, you might even consider making notes beside each term, including when they were used, the engagement you’re seeing, and the posts they were used with. To be clear, the rules around #hashtag usage for business are not static. As social platforms get hip to those who “game the system”, they will update their rules (algorithms) to correct course. It is worth learning how they work today, but equally as valuable to stay on top of any changes to the game so you can stay relevant and continue to engage your tribe. Marketing’s not hard. Keeping up with the rule changes is. 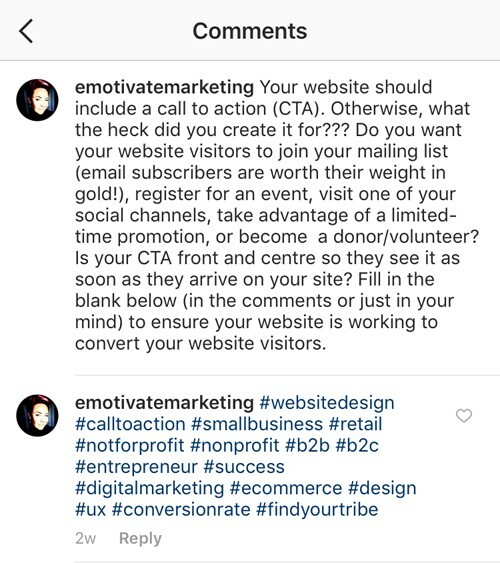 Go to emotivate.online to schedule your free 15-minute call with Laurie so you can get clear on how to grow your business with website, email marketing, and social media. Wanna receive monthly marketing tips in your inbox that will keep you in the know and help you grow your business? Go to emotivate.tips! Originally published on Laurie’s blog.